We’d love your help. Let us know what’s wrong with this preview of Scaredy Squirrel by Mélanie Watt. Day after day he watches and waits, and waits and watches, un Scaredy Squirrel never leaves his nut tree. It's way too dangerous out there. He could encounter tarantulas, green Martians or killer bees. But in his tree, every day is the same and if danger comes along, he's well-prepared. Scaredy Squirrel's emergency kit includes antibacterial soap, Band-Aids and a parachute. To ask other readers questions about Scaredy Squirrel, please sign up. I stole this style of review from Heather's (well, Heather's daughter's) fantastic review of Ladybug Girl at the Beach. Her review is a lot more... focused. Interviewer/ Dad: What did you think about Scaredy Squirrel? Eleanor: I thought it was good. Gwennie: Scardey Squirrel's about scarey. Dad: Ellie, why did you like it? Eleanor: Because I wanted to. Why are you typing that? Dad: Gwennie, did you like Scaredy Squirrel? Dad: What happe I stole this style of review from Heather's (well, Heather's daughter's) fantastic review of Ladybug Girl at the Beach. Her review is a lot more... focused. Dad: What happened in Scaredy Squirrel? Eleanor: He was afraid. That's what happened. E: Afraid of KILLER BEES!!! What else was he afraid of Dad? D: Well, was he afraid of ice cream? E: heh heh heh NOOOOOoooo... Was he afraid of ice cream dad? Yes or no. E: What was he afraid of? D: You tell me what he was afraid of. E: He was afraid of killer beeeeees, taRANtulas, germs, sharks, poison ivy. That's what he was afraid of. Where's Gwennie? D: Gwennie left the interview. E: GWENNIE! COME BACK TO THE INTERVIEW!!! Did you get the bank? Can I have it? Can I put in the money? E: I wanna put it like this! G: No, no, don't push me. D: Hey guys, can we get back to the interview? G: I wanna go downstairs. E: Gwennie, can I have more money? G: Yeah, you can have more money. E: Can I have a lot of money?... ... Is Gwennie not at the interview? ... What's a view? D. An INTERview is where someone asks you a lot of questions about something. Like, I'm asking you a lot of questions about Scaredy Squirrel. D: Do you want to say anything else about Scaredy Squirrel? E: Yeah. I wanna say that he's afraid. D: You already said that. E: Uhhh... HEEEeee... uhhh... is Scaredy Squirrel afraid of money? D: Uhhh... I don't know. This is adorable. I think young kids will get the gist but it helps to be older to understand all the inside information. This is one of those picture books (such as Oh, the Places You'll Go! ) that can make a great gift for adults. I loved the smiling bees, although I’m not sure I’m particularly fond of the pictures, as I was in Watt’s Chester books. I’m afraid of bees. (Mélanie Watt is afraid of sharks.) Scaredy Squirrel is afraid of a lot of things, including some things that are outlandish (f This is adorable. I think young kids will get the gist but it helps to be older to understand all the inside information. This is one of those picture books (such as Oh, the Places You'll Go! ) that can make a great gift for adults. I loved the smiling bees, although I’m not sure I’m particularly fond of the pictures, as I was in Watt’s Chester books. I’m afraid of bees. (Mélanie Watt is afraid of sharks.) Scaredy Squirrel is afraid of a lot of things, including some things that are outlandish (for a squirrel) so that this is a very amusing book. I also appreciated how the end isn’t “unrealistic” and doesn’t deviate from the rest of the book’s story. 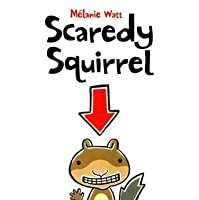 I think I’ll read the other Scaredy Squirrel books and all/most of this author/illustrator’s books. There’s a very cute very short author bio and self portrait in the back inside cover of the book. Simple and clear it tells the story of our mental fears and their impact on our lives. Highly recommended to all politicians and generals! 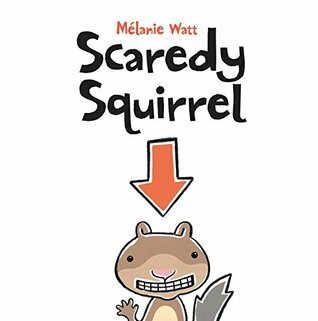 The unknown can be a scary place for a squirrel," but the hero of Mélanie Watt's hilarious Scaredy Squirrel thinks he has it all under control. Unwilling to risk running into: green Martians, killer bees, tarantulas, poison ivy, germs, or sharks, he never leaves his tree, keeping to the same schedule every day. In the unlikely event that he is forced to evacuate, he has a contingency plan that is full-proof. Or is it...? 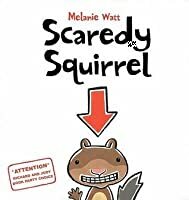 With engaging text and simple but appealing charcoal and acrylic illustratio The unknown can be a scary place for a squirrel," but the hero of Mélanie Watt's hilarious Scaredy Squirrel thinks he has it all under control. Unwilling to risk running into: green Martians, killer bees, tarantulas, poison ivy, germs, or sharks, he never leaves his tree, keeping to the same schedule every day. In the unlikely event that he is forced to evacuate, he has a contingency plan that is full-proof. Or is it...? `From the flap copy: ‘Here’s the story, in a nutshell: I never leave my nut tree. It’s way too dangerous out there. I could encounter germs, poison ivy or sharks. If danger comes along, I’m prepared. I have antibacterial soap, Band-Aids and a parachute. But things really get shaken up later in the book when I’m forced out of my tree by a vicious intruder! Will I survive this ordeal? Will I undergo a life-changing experience? Will I discover my true inner self?’ No spoilers here, you’ll have to read the book to find out! I liked squirrels a lot better when I first saw this book; that was before I had to spend $300 to have a nest of squirrels relocated from my attic. But Scaredy is a charmer, from the cover illustration where he’s gamely gritting his teeth to his graphs & lists & comparison charts, such as the Advantages of Never Leaving the Nut Tree (9 items), which clearly wins out over the Disadvantages (3 items). Kids will have fun telling their own stories using the book as a writing model. They may also remember other favorite worrywarts from children’s books, such as Kevin Henkes’ Wemberly Worried, a favorite of mine. To my amazement, I have a real-world connection to this book after scanning the book reviews. Publishers Weekly said, “It’s an indication of how well Watt…knows her helicopter-parented audience that she’s able to turn the phrase ‘antibacterial soap’ into a bona fide punchline.” Thanks, Pat! Scaredy Squirrel is awesome! Scaredy Squirrel is also: predictable, prepared, organized, vigilant, adventurous, and unpredictable. By extension, Mélanie Watt must also be: predictable, prepared, organized, vigilant, adventurous, unpredictable and, most definitely, awesome! I love that Scaredy Squirrel makes lists and tries his utmost to be prepared for the things that scare him. I also love how he responds when his life becomes a bit topsy-turvy! Thanks so much to my GR friend Lisa for recommendi Scaredy Squirrel is awesome! Scaredy Squirrel is also: predictable, prepared, organized, vigilant, adventurous, and unpredictable. By extension, Mélanie Watt must also be: predictable, prepared, organized, vigilant, adventurous, unpredictable and, most definitely, awesome! Fun book that tackles the issue of anxiety in a child appropriate way. Scaredy squirrel is anxious about life outside his tree. He does the same things at the same times (book also helps teach time), eats the same things, and is scared of anything new. Until one day.....scaredy squirrel learns that he can have a great adventure by breaking his routine...a little bit. Cute story. The Turkeybird Speaks(My 3 year old son's POV): "This book is one of those that I just can't put down. My favorite is when my dad reads it, 'wake up, eat a nut, look at a view, eat a nut...', he just does such a good job! Scaredy Squirrel is one of those characters you love instantly, I mean, he's really a flying squirrel! He can fly! How cool is that? And he's afraid of bee's and I am not a fan at all. I once had one sting me and my thumb swelled up like a balloon! So of course you want to stay The Turkeybird Speaks(My 3 year old son's POV): "This book is one of those that I just can't put down. My favorite is when my dad reads it, 'wake up, eat a nut, look at a view, eat a nut...', he just does such a good job! Scaredy Squirrel is one of those characters you love instantly, I mean, he's really a flying squirrel! He can fly! How cool is that? And he's afraid of bee's and I am not a fan at all. I once had one sting me and my thumb swelled up like a balloon! So of course you want to stay away from those terrible bugs! "My favorite part though has to be his emergency kit! He has everything you could ever need in there to keep away all the scary things you might encounter! Although I'm still not quite sure why he's afraid of sharks? I LOVE sharks! But my mom doesn't, so maybe it's an adult thing??? Anyway, the emergency kit! My mom and I even drew one up together. They have one you can print off on the website for the book and it is incredible! You have to try it out! Of course we included band-aids, just like squirrel, because they are my favorite thing to stick to my body (even if I don't have a 'good' reason for it, as my mom would say)! "This is a definite must read with any guy or girl you know! Pick it up and enjoy Scaredy Squirrel's funny adventure!" Mom's Two Cents: "The Turkeybird is right, this is one funny book! It was actually awarded the ALA's award for most Notable Children's Book in 2007 and I completely agree. My husband, The Baker, reads to The Turkeybird every night before bed as there time together the rest of the day is limited and this is something they love to do together. Well, at least every other night he asks for this book. I love to hear him chuckle in the other room as he see's Scaredy Squirrel fall from the tree to discover he can fly and that the world outside his tree isn't really as bad as he first thought. 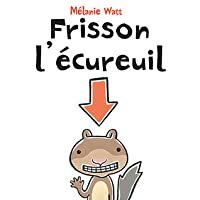 From the author: "Mélanie has often noted how the Scaredy Squirrel books helped her work out her own insecurities and fears, as the success of these titles has required her to venture out into the unknown, and like Scaredy she has found the experience truly uplifting." "In reality, though this book is funny and entertaining it teaches a wonderful lesson to children of all ages. When we stay in our shells, be it our homes or a safe place (a job, a city, a rut, anything), we could be missing out on all the world has to offer us. In Scaredy Squirrel's case it was knowing he could fly and see more of the world around him. Granted he still has some other fears to overcome, but it's all about taking things one step at a time. And who couldn't use that?" The1stdaughter Recommends: Ages 3 and up. For kids (and adults) who may be frightened to step outside of their front door (or even their comfort zone). Scaredy Squirrel is a beautifully written witty book about courage and knowing our fears. The book is about a nervous squirrel who never ever leaves the safety of his little nut tree in to the dangerous realms of The Unknown! He is scared of many things, including germs, and indeed instructs us to wash our hands with antibacterial soap before reading any further! Scaredy Squirrel is scared of: green Martians, killer bees, tarantulas, poison ivy and sharks. Of course none of these creatures are in Scaredy Squirrel is a beautifully written witty book about courage and knowing our fears. The book is about a nervous squirrel who never ever leaves the safety of his little nut tree in to the dangerous realms of The Unknown! He is scared of many things, including germs, and indeed instructs us to wash our hands with antibacterial soap before reading any further! Scaredy Squirrel is scared of: green Martians, killer bees, tarantulas, poison ivy and sharks. Of course none of these creatures are in his little, safe nut tree but it does mean he only gets to see and do the same old things every day. However, if anything unusual did happen, do not worry; Scaredy Squirrel has his trusty emergency kit and plans for every eventuality… which mainly end in playing dead. One day something happens, something he did not plan for! A killer bee arrives in our poor Scaredy Squirrels tree and he knocks his emergency kit straight out of the tree! Scaredy Squirrel jumps without thinking, to catch his kit and then something incredible happens! Scaredy Squirrel begins to glide, after all this time, he has finally found out he is a flying squirrel. If he had never jumped out of the tree, into The Unknown, he would never have known. This flying squirrel discovers he loves flying and forgets all about the killer bee in his home and all the other things of which he is afraid. Finally he lands in a bush and plays dead for two whole hours and then when he is quite content that nothing terrible is happening, returns to his nice, safe tree. His experience has inspired him and now every day although he is still quite a nervous little squirrel, he jumps into The Unknown every single day and he forget all about his emergency kit. I think this book is fantastic in so many ways. The tale in itself is so appropriate to modern life for children in which they may be worried about many things. This story shows us it is ok to worry sometimes but if you are too scared it may stop you experiencing some wonderful things. You may never learn the best things about yourself! We all need to push ourselves sometimes in life and this book illustrates that in the most lovely and understandable way. Whilst I would say this book is aimed at the 4-9 age group I honestly think it would be enjoyed by a whole range of children and adults. The themes in it can be discussed deeply or it can be taken for the lovely story with exciting pictures that it is. I also think it is particularly useful that the book contains a very well written foreword and an end note about the author. This makes it useful in class for exploration around the structure of books. This book could also be used in PSHE classes to discuss situations in which we have achieved something which was initially for us or things we might want to try in future. The illustrations in this book are fantastic, although quite simple there are many things to look at and I believe this is a book pupil and teacher alike will want to look at time and time again! So remember everyone- you might just be able to fly if you jump out into The Unknown one day! Brilliant picture book about a squirrel who feels fearful and anxious towards life, so he copes by trying to control every single possibility. But when an unexpected situation arises, he learns that he has a more adventurous spirit then he realized, and his body is equipped for it as well. The book is full of Scaredy Squirrel's lists, checklists, diagrams, schedules, maps, plans, and instructions. Simple iconic illustrations complement the text perfectly. its super cute my 3 year old brother and me love reading it together! Best book I've ever read I loved it so much i feel like it really just speaks to me. I felt that. Watt has a seriously great sense of humour and fantastic illustration style. I can’t wait to dig into a few more of these tonight. This review has been hidden because it contains spoilers. To view it, click here. This review applies to all of the SS books. Contains spoiler-ish information-- don't continue reading if that sort of thing bothers you! I absolutely ADORE Melanie Watt's Scaredy Squirrel collection. The books are clever, funny, and cuter than all get-out! I could write for days about Watt's clever use of visual symbols and metaphors, and her remarkable attention to detail. While these kinds of imaginative touches are not unique among high-quality children's books, I feel she does a particularly This review applies to all of the SS books. Contains spoiler-ish information-- don't continue reading if that sort of thing bothers you! I absolutely ADORE Melanie Watt's Scaredy Squirrel collection. The books are clever, funny, and cuter than all get-out! I could write for days about Watt's clever use of visual symbols and metaphors, and her remarkable attention to detail. While these kinds of imaginative touches are not unique among high-quality children's books, I feel she does a particularly stunning (and amusing) job of incorporating those little touches to great effect. I own all four books, and have read each to my fourth grade students. We are obsessed! As a class, we're even working on our own version, featuring our class pet (a similarly easily-frightened Roborovski dwarf hamster). Scaredy Squirrel is a lovable but misguided rodent who carefully considers everything that scares him and constructs emergency kits and extensive plans to keep himself safe. Invariably, something comes up that he hasn't forseen ("This was NOT part of the plan! "), and after panicking for a moment (and playing dead-- his consistent defense of last resort), he discovers that this scary twist of fortune is really not scary at all. He realizes that the new experience is actually fun, and that realization prompts him to make some small change to his lifestyle. Kids love him because he's funny and cute. I love him for the same reasons, but also because I see a lot of his quirky tendencies in myself and others I know. He's a bit of a perfectionist, has an offbeat sense of humor, and is somewhat socially-awkward. (He's also into knitting and scrapbooking, two things I LOVE.) Most importantly, he has an almost obsessive need for control, devising extensive plans in an attempt to overcome his fears of a scary world. I'm sure a lot of adults can identify with that kind of behavior, and can also find comfort and inspiration in his ability to (eventually...) recognize that not all change is bad, and that with a few small changes to one's routine and outlook, it's possible to achieve a better balance between safety and fun. This book was recommended to me on Goodreads in the little sidebar based on something else that I had read (I can’t remember what at the moment), and I thought it looked pretty cute. I requested it at the library where I work and decided to take it home to read instead of reading it at work like I usually do (it’s only 40 pages so it took about five seconds). It’s really cute! Scaredy Squirrel never leaves his tree; it’s safe, has a great view, and has plenty of nuts for him to eat. The rest of t This book was recommended to me on Goodreads in the little sidebar based on something else that I had read (I can’t remember what at the moment), and I thought it looked pretty cute. I requested it at the library where I work and decided to take it home to read instead of reading it at work like I usually do (it’s only 40 pages so it took about five seconds). It’s really cute! Scaredy Squirrel never leaves his tree; it’s safe, has a great view, and has plenty of nuts for him to eat. The rest of the world is unknown and that it way too scary for Scaredy Squirrel. There might be germs or aliens or poison ivy out there, and he’s not going to risk it. But one day something forces him out of the comfort of his tree into the great unknown and Scaredy Squirrel discovers that it might not be so scary after all. I quite enjoyed the adorable illustrations and diagrams of Scaredy Squirrel’s home, his escape plan in case of dangerous things, the advantages/disadvantages of never leaving his nut tree, and more! Such a cute way to keep kids engaged. I think the little foldout page might’ve been a waste and unnecessary, but kids love that kind of stuff, so it’s a great kids’ book. I’ll be recommending this one for our preschool story time at the library. As a lover of travel and experiencing new things, I loved this book. You never know what you’re going to find out in the great unknown if you are too scared to leave where you are most comfortable. You might find new places to call home or new friends to cherish or a great multitude of other, wonderful things out there. Go forth and find them! This is a story about a very scared squirrel who never leaves his nut tree. He has lots of worries and fears about the unknown world outside his nut tree and is very conscious that germs are everywhere. He likes to think he is a well prepared squirrel with his emergency kit for if anything unexpected where to happen. I really like this book, it’s very simple and easy to read but there are a lot of engaging pages to the book. It doesn’t read like the usual flow of a story, but has lists and diagra This is a story about a very scared squirrel who never leaves his nut tree. He has lots of worries and fears about the unknown world outside his nut tree and is very conscious that germs are everywhere. He likes to think he is a well prepared squirrel with his emergency kit for if anything unexpected where to happen. I really like this book, it’s very simple and easy to read but there are a lot of engaging pages to the book. It doesn’t read like the usual flow of a story, but has lists and diagrams with words and phrases to allow very short ‘choppy’ reading which I feel works well for this type of story. I think this book could be used across many different areas of the curriculum in schools as well as for different ages of children. I think the book would be a good read for children in the Early Years Foundation Stage as well as Key Stage 1 (4-7 years) as there is a lot of reference to fear and emotion, something that could be linked to a PSED session. There is reference to time, sequencing, lists and comparing differences, all of which can be linked to Maths and Literacy. Scaredy Squirrel’s obsession with germs and keeping anti-bacterial soap is also a great way to introduce young children to hygiene and keeping safe. I was introduced to this book at library storytime. The librarians really like this book and the sequels, and the kids there get into it a lot. Scaredy squirrel is afraid of... well... everything. Mostly the unknown. After all - it may contain sharks! Or germs! Or green martians! Or... KILLER BEES!!!!! So he just stays in his tree. He can eat a nut and look at the view, eat a nut and look at the view all day long. No excitement. No danger. Everything absolutely under control. Until a killer bee ap I was introduced to this book at library storytime. The librarians really like this book and the sequels, and the kids there get into it a lot. Until a killer bee appears, flinging the poor squirrel to the ground. Luckily, he finds out he's a flying squirrel. And luckier still, he knows just what to do. Playing dead, after all, is ALWAYS a good option. So he hangs out there for two hours and goes home, and makes DRASTIC changes to his life. Now, we learn, he goes out into THE UNKNOWN every day for two hours to play dead. It was in a design class taught by Michèle Lemieux at the University of Quebec in Montreal that author and illustrator Mélanie Watt created her first picture book, Leon the Chameleon, which was later published by Kids Can Press. Watt went on to create several more books, including the Learning with Animals collection and Augustine, which was named an ALA Notable Children's Book. Watt has also illu It was in a design class taught by Michèle Lemieux at the University of Quebec in Montreal that author and illustrator Mélanie Watt created her first picture book, Leon the Chameleon, which was later published by Kids Can Press. Watt went on to create several more books, including the Learning with Animals collection and Augustine, which was named an ALA Notable Children's Book. Watt has also illustrated Where Does a Tiger-Heron Spend the Night? and Bearcub and Mama, which won the 2006 IRA Teachers' Choices Project.